So, dating these days is pretty much all over the place. Anything and everything goes and sometimes nothing goes. 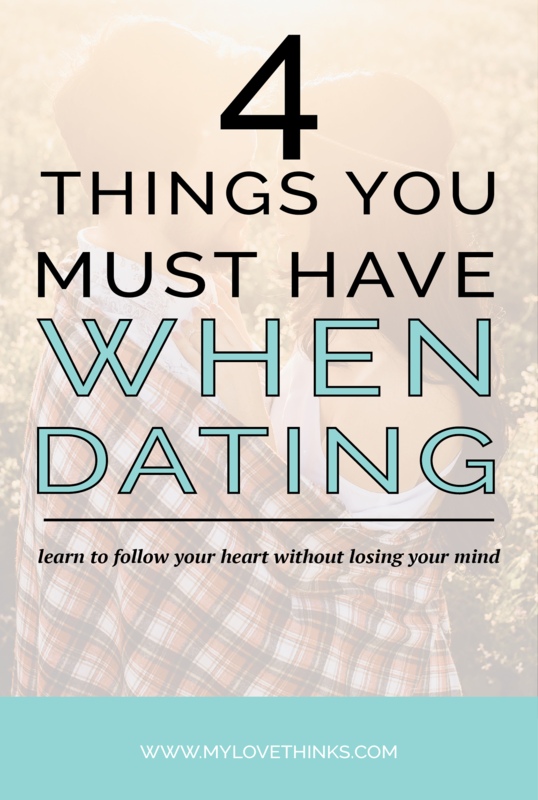 But I am going to strongly state that, if you really do want to find love and a healthy relationship, there are 4 things you must have when you’re dating. You probably don’t get in the car very often without a destination in mind, right?! So, when you date, decide on your destination. Do I need to be more direct here?! I’m saying, know what you are looking for. Don’t just put yourself out there and “figure out” what you like while you’re dating. Give it some real reflection and think about what is important to you, what type of values you want your dating partner to have, what they like to do for fun, what his/her personality should be like? Now just for the record, sometimes you will learn some of this stuff while dating. Like, oh yeah, I really can’t stand someone who chomps their gum…or other important things like that. But the idea is that you should go into dating with a general idea of what you’re looking for. Just like you should have your list of ideals, it’s important to have a list of deal breakers. These are the things that you will not compromise on, no matter how exciting, hot, funny, intelligent, rich or fill-in-the-blank. This is the list that does not bend much. It’s way easier to outline these things before you’re in a relationship, because once you’ve become blinded by love or infatuation it’s just way harder to be assertive with your deal breakers and way too easy to rationalize. So, power balls, huh?! Like the lottery. NO! So many people treat dating like it’s the lottery, like finding a good relationship is something that just happens by chance or luck. How many times have you caught yourself saying something like “oh it just wasn’t meant to be” or “it is what it is” or “eh, what will be will be”? These sayings imply that dating and finding love is completely out of your control. That healthy relationships are a unicorn that you can only hope to see someday and that you are powerless and simply passive in the dating process. Now don’t get me wrong, some relationships really weren’t meant to be. But the reality is there is an epidemic of passivity when it comes to dating and relationships and it just doesn’t have to be this way. We are in control of our dating lives and choices and need to think of ourselves as active managers of our relationships. We need to regain our personal agency; our power in relationships. That’s also where the balls come in. This stuff takes guts. To take control of your relationship, you will periodically need to show some vulnerability and courage. But I challenge you to step up and take charge of your dating life. Ask out that person that you are interested in…not just to “hang,” but on a real, legit date. Bring up the define the relationship talk. Definition is good and provides clear expectations of what to do and how to act in a relationship. And, if they can’t define it, then there’s your sign. End that relationship that is making you feel crazy. Don’t accept Netflix and Chill as a real date. Go for it! You do have power and say in relationships and, yes, it almost always takes some balls. This is somewhat of an echoing of the other points. But, in a world where there is such blurriness between what is right and wrong and when all things are “acceptable,” it can be difficult to have and execute standards. At times, you may feel uptight or lame or too picky for having some standards, but I assure you any discomfort that you may feel is worth it. It is about time we reclaim some pride in having standards, ideals, deal breakers, assertiveness and clarity on the commitment levels of our relationships. This does not make you judgmental, rude, controlling or critical. But it does make you intentional, thoughtful, direct and secure. Speaking of intentionality in relationships, we just wrapped up our first online course called Head Meets Heart. 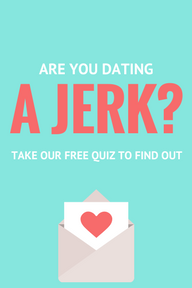 This course is based on the best-selling book, How to Avoid Falling In Love with A Jerk and program (by the same name) that has been taught in live settings for over 20 years. We are beyond excited to offer the course in such a convenient format. In the course, you will learn how to be intentional in how you develop a new relationship as well as what the most important areas are (backed by research of course) to get to know about a partner! This course will empower you in your dating relationships and help you to date with confidence and with a plan! Sound interesting? Check it out here. Or feel free to email us with any questions! info@lovethinks.com. Oh and PS we’re offering it at a discounted rate for a limited time!